Despite a hugely profitable year, Goldman Sachs has lost its Midas touch as the premier investment bank. Charlie Gasparino on how the competition caught up and what its future holds. The PR spin out of Goldman Sachs these days—just as the firm is about to redistribute billions of taxpayer bailout money in the form of year-end bonuses—is that the firm is once again very solid. The traders are making money, and Goldman’s famed “client” or investment-banking business, which manages the investment needs of the world’s biggest companies, hasn’t been touched, the people at Goldman assure me. Big companies are still flocking to Goldman’s investment bankers to sell stock or for advice on mergers and acquisitions. To be sure, Goldman is immensely profitable thanks to its savvy traders, hence its massive bonus pool that's expected to grow to around $20 billion by the end of the year and the spectacle of the firm’s normally press-shy CEO Lloyd Blankfein trying to court reporters with bizarre claims that the firm’s bankers and traders are really doing “God’s work.” But that doesn’t mean Goldman’s image problems haven’t translated into a bigger problem that is showing signs of affecting its bottom line, or to be more precise, the bottom line of Goldman’s business outside risk-taking: its once-mighty investment bank that services the needs of the world’s biggest corporations. You see, before Goldman became what is in essence a risk-taking hedge fund under Blankfein, the firm was Wall Street’s premier investment bank. No longer, it seems. Goldman’s deal-making machine faces mounting competition from megabank J.P. Morgan, and now from Morgan Stanley, which had been losing ground, but is now, like J.P. Morgan, challenging Goldman in the business of underwriting stocks for major companies, according to the latest “league-table” statistics from a company called Dealogic that tracks such activity. These deals are important because they represent Wall Street's real growth businesses: Banks have been issuing stock in massive numbers this year both to repair their toxic-debt-ridden balance sheets, but also to repay government bailout money. (M&A and IPO activity have been weak compared to past years.) What’s more, these same statistics indicate that Goldman is showing few signs of reversing this trend, which seems to have corresponded nearly to the moment its current string of bad press began in early 2008, as the financial crisis started kicking into high gear. • Jacki Zehner & Katharine Rhodes Henderson: Can Goldman Find God?What can account for Goldman’s looming second-tier status in what used to be the firm’s first-tier business? Some of it is clearly better competition. J.P. Morgan CEO Jamie Dimon wisely steered his firm clear of the subprime crisis and is considered one of the most respected CEOs in corporate America, which carries its own cachet. Moreover, J.P. Morgan simply has more resources to offer clients than Goldman, such as a massive balance sheet of bank deposits. Meanwhile, Morgan Stanley CEO John Mack, after getting battered during the financial crisis with risky trades, has changed the firm’s business model to focus on providing high-end financial advice to corporations. But surveys taken by some of these same rival firms have also indicated that the controversy surrounding Goldman—which includes charges that the firm received favored status during last year’s bailouts and is now using government money to enrich its partners—is taking a toll on its reputation. Rightly or wrongly, Goldman has begun to symbolize the unholy relationship between big government and Wall Street, which gets bailed out with taxpayer money and earns billions of dollars in profits as unemployment on Main Street rises to 10.5 percent. And in an era where corporate America is more politically correct than ever—firms now routinely highlight their commitment to left-leaning causes such as “green jobs”—it’s becoming increasingly politically correct to choose bankers other than the guys at Goldman Sachs. On its face, the erosion of Goldman’s client business shouldn’t matter given the firm’s dominance in trading, which is producing huge earnings this year. But the risk-based model of trading carries its own risk for Goldman long term. As a consequence of its bailout last year, Goldman has been deemed a commercial bank, meaning it has explicit support from the Fed and can borrow cheaply at the discount window. That, combined with near-zero interest rates, has given Goldman an artificial edge: By borrowing so cheaply and with Fed protection, it can make money trading with its eyes closed. And it is. But the cheap money won’t last forever—at some point as the dollar gets pounded or if inflation begins to rise, the Fed will have to raise interest rates. Because it is backed up by the Fed, Goldman can no longer use leverage, or borrowing, to make complex bond-market bets that produce big results. In other words, Goldman’s massive trading profits will last as long as the Fed maintains its subsidy, which is why Goldman needs a vibrant client business if it’s to effectively compete in the new post-financial crisis business environment. To be sure, competitors have been predicting Goldman’s demise in this area for years, for the simple reason that as an investment bank, it didn’t have the resources to compete with megafinancial institutions like J.P. Morgan and Citigroup. That said, Goldman Sachs spokesman Lucas Van Praag, who will earn his big bonus this year, doesn’t quite make the case that the firm’s client business is still golden. The problem with Van Praag’s analysis is that he’s clearly cherry-picking his dates (perhaps JP Morgan is No. 1 since October? ), and simply underwriting more deals since 2001 doesn’t take into account the trend lines, which puts J.P. Morgan and its CEO (who is considered a relative saint compared to Blankfein) in the lead. But the biggest piece of evidence I have that Goldman knows its once-dominant client franchise is in trouble is that the firm is talking. In past, the most repeated words by Goldman’s press department were “no comment.” The firm was above responding to criticism because there was nothing that could shake its clients' confidence in its abilities. Those days are clearly over, even if Blankfein and company are now doing God’s work. God, however, could not be reached for comment. 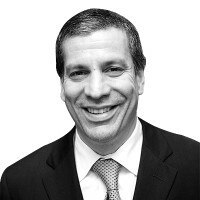 Charles Gasparino is CNBC's on-air editor and appears as a daily member of CNBC's ensemble. He is a columnist for The Daily Beast and a frequent contributor to the New York Post, Forbes, and other publications. His new book about the financial crisis, The Sellout, was published by HarperBusiness.